I’ve written several times about BIG MAX Golf’s push carts—the most popular carts in Europe. Now BIG MAX has a line of top-notch golf bags that match the quality and engineering of their carts. 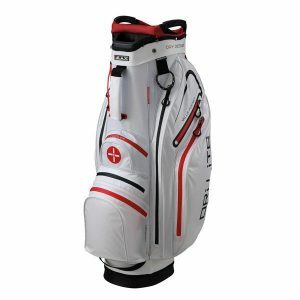 The new bags by BIG MAX include two models of cart bags, the Aqua Sport 2 ($300) and the Dri Lite Active ($230), and three stand bags, the Aqua Ocean ($180), Aqua Wave ($250), and Dri Lite G ($200). This season, I’m pairing a read and black Dri Lite Active bag with my trusty push cart, as I walk 100% of my rounds at my home course, Lake of the Woods Golf Course in Mahomet, Illinois, and whenever possible at other courses. The Dri Lite Active weighs in at just 4.8 lbs., yet has 9 spacious pockets and 14-way divided top for all your clubs. The bag also comes with a matching umbrella, which I really appreciated, as golf umbrellas seem to wear out or break on me more than just about any other piece of equipment. There are three key performance metrics of golf bags for me: weight, pocket organization, and ease with which the clubs can be extracted and replaced. We’ve already covered the weight of the Dri Lite Active: I’ve had stand bags that were not much lighter. As for the pockets, there are two felt-lined “Value Pockets,” and a spacious central insulated cooler pocket. In short, there’s room for everything you could want to carry along, and even room for stuff you probably don’t need (like my ridiculous collection of souvenir pitch mark repair tools). Extraction and replacement of clubs in the 14-way divider is perfectly smooth. My grips grabbed and stuck in my old bag, forcing me to yank them out and force them in. Not in the Dri Lite Active: clubs slide out and drop in nearly friction-free. One major feature of the Dri Lite that we haven’t even mentioned yet is the flawless waterproofing of the bag. I’ve had this bag out in some fairly steady rains, and everything in all pockets has stayed bone-dry, as one might expect from a bag originally targeted at UK golfers. The only downside of this fastidious protection from the damp is that the pocket zippers are sort of sticky – they won’t let any water in, but sometimes you need two hands to open and close them. There’s one other feature of the Dri Lite Active that we haven’t addressed, and that’s the stylish design, with striking yet minimalist lines and color combinations. Every time I’ve been out this year, someone asks me, “New bag? Who makes it?” It just looks sharp. I’ve owned a lot of golf bags over the years, and I am being completely honest when I say that this is my favorite.